Cushex Drops-M - New Look, Same Great Formula! Cushex Drops-M is a homeopathic medicine to temporarily relieve the symptoms of Cushing's Disease in dogs and cats. Cushex Drops-M is a homeopathic medicine formulated to relieve the symptoms caused by an imbalance of the adrenal and pituitary glands. Cushex Drops-M encourages detoxification by draining toxins from the liver and kidneys. Cushex Drops-M can be used along with Cushex Drops-S, an herbal formula that supports the health of the adrenal and pituitary glands. I have been using Cushex M and S drops for my 10 year old chiuahaha. She no longer has accidental pee episodes, her stomach is no longer drooping, and she has more energy and plays with my other chiuahaha. She does like her food, but shes not ready to attack me for it anymore. It really works well to keep the symptoms down, and brings back her personality. I had her on veterol prescription medicine for 1 year and it just made her lifeless. I cant express how much you need to give this to your dog with cushings! It really does work!!! I have been using these drops for over 2 years and they seem to be working on my Daisy versus the medication from my vet. Arsenicum album (30C): excessive thirst, digestive upset including nausea, vomiting, sudden gastric pain and dyspepsia, skin problems including itching, burning, dry, rough, scaly skin. Berberis vulgaris 3X: urinary disturbances, nausea, heartburn, hepatic drainage remedy. Chelidonium majus 2X: acts mainly upon the whole digestive tract, including nausea and vomiting, jaundice skin due to hepatic and gall bladder obstruction, elective on the liver. Hepar sulphuris calcareum 30C: discomfort in liver region, distended abdomen. Unhealthy skin. Mercurius solubilis 30C: weak memory and loss of will power, vertigo, putrid belching, intense thirst, enlarged liver sore to touch, jaundice, digestive issues including entercolitis and stomatitis, gingivitis. Sulphur 30C: putrid belching (eructations), loss or excessive appetitie, abdomen very sensitive to pressure, pain and soreness over liver, frequent urination, skin problems including dry scaly skin, itching and burning, and hepatic insufficiency. Taraxacum officinale 2X: gastric headaches, bilious attacks and jaundice skin. 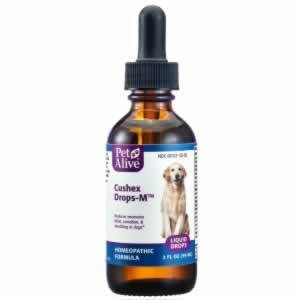 PetAlive Cushex Drops-M come in convenient tincture form. 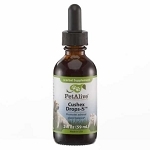 The drops are easy to administer to pets and may be mixed with food or a treat. One 2 oz. bottle of Cushex Drops will last for 20-80 days, depending on the size and needs of your pet. Use the dropper or a syringe to administer into your pet's mouth or mix into its food or water. For all pets: 0.50 mL 3-5 times daily. For acute symptoms, administer every 30 minutes as needed or until symptoms subside, or up to 48 hours. For additional support, Cushex Drops-M can be used concurrently with Cushex Drops-S, an herbal supplement by PetAlive. For more information, visit our webpage Canine Cushings Disease. Caution: Not recommended for dogs with Addison's disease.